Jonathan Sage made his concerto debut in 2002 and has gone on to appear as soloist with orchestras including the London Mozart Players, Dartington Festival Orchestra, YMS Orchestra, York Sinfonietta, Hessle Sinfonia and the Scarborough Symphony Orchestra; working with conductors including Diego Masson, Ralph Woodward and Shaun Matthew. In June 2013, Jonathan appeared as soloist/director of the Ergodos Musicians in a performance of the Mozart Clarinet Concerto and a new concerto by Irish composer Garrett Sholdice, Am Obersee, in Christchurch Cathedral Dublin. In November 2009, Jonathan played to a capacity audience at Huddersfield Contemporary Music Festival, performing Steve Reich’s New York Counterpoint. He has also given performances at the Ergodos MMX and Off-Grid Festivals in Ireland’s National Concert Hall, LEAP (Berlin), the York Spring Festival, Sampler Festival (London), Kaleidoscope (Dublin), the Edinburgh Festival, the Late Music Festival (York), the Dartington International Festival, the International Conference on Music Since Nineteen-hundred 2007, the GEMdays Festival (Hudds), ICMC and the University of York Concert Series. 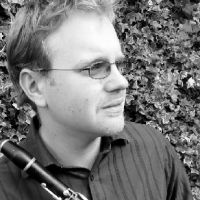 In 2008, Jonathan toured Ireland, playing a programme of solo contemporary clarinet and basset clarinet music and also giving lecture recitals at Trinity College Dublin and Dundalk Institute of Technology. Commissions for the tour included works by Jonathan Nangle, Garrett Sholdice and Alexander Harker, supported by the Irish Arts Council. Jonathan is also active as a chamber musician, playing regularly with groups including Bewegung Ensemble, the White Rose Trio, Dark Inventions and the Ergodos Musicians with whom he recently recorded and toured in the USA and throughout Europe. As an orchestral musician, Jonathan has guest performed with orchestras including the London Mozart Players, New Mozart Orchestra, I Maestri and the Yorkshire Sinfonietta. As a recording artist, Jonathan appears on labels including Ergodos Records, Audiobulb and UYMP. His debut release solo release - entitled Counterpoint -features Steve Reich’s New York Counterpoint, and was described as a “masterful interpretation” by Lyric FM’s Paddy Kehoe. The album has also received regular radio airplay on Lyric FM’s Nova and on New York’s WNYC. Counterpoint can be purchased from http://www.ergodos.ie/shop/counterpoint/ and is available to download from iTunes.